Border Police officers shoot and kill female Arab who tried to ram her car into them in Silwad. A Palestinian Arab woman on Friday afternoon tried to ram a car into Border Police officers near Ofra. The officers were able to shoot her dead before she was able to carry out the attack, the police said. "An attempted attack to ram a car into border guards deployed in the village of Silwad (northwest of Ramallah) failed. The border guards spotted the terrorist... fired on her and killed her," a police spokesman said in a statement quoted by AFP. The attempted car attack comes exactly one week after a similar attempt in the same area. Last Friday, a terrorist tried to run over IDF soldiers at the entrance to Ofra. 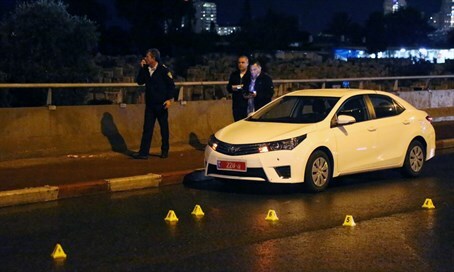 The soldiers were able to avoid the vehicle and opened fire at the terrorist, killing him. In a search of the vehicle after the terrorist was neutralized, a large knife was found, and it is believed the terrorist planned to carry out a bigger attack. There were no Israeli casualties in the incident. The attacks are part of the ongoing terror wave which has been ongoing since before the Rosh Hashanah holiday. Many begin counting the current terror wave from the murder of Alexander Levlovich in a Jerusalem rock attack in mid-September; including him, a full 24 victims have been murdered. It is worth noting that aside from the 140 attacks recorded, thousands of rock attacks have been conducted - as of December 16, no fewer than 2,225 rock attacks had been committed since Levlovich’s murder.